George is an inspirational graduate who enlightened us about his journey through his academic years. He is an alumnus of the University of Brighton, achieving a first-class degree in LLB Hons Law with Business from 2011-2014. George stressed the importance of taking up the opportunities on offer. Throughout his progression in the course, it became evident to him that the legal field is very competitive, so he realised he needed to boost his CV. He took on mooting as an extracurricular and by the time he was in his final year, his team had reached the semi finals of OUP moot, which was quite an accomplishment. It also portrayed to us that mooting can be a great way to boost our confidence and develop our speaking skills. 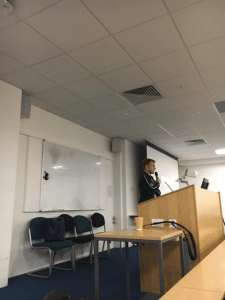 In addition, Callum (his friend) and himself, started a negotiation club within the University to strengthen their base and foundations as lawyers. George also made the effort to attend court hearings which helped him to gain a further sense of life as a lawyer. George stressed the importance of time management and prioritisation for students to avoid being ‘swamped’ by work. He also told us that he had had a lot of fun at university, being a member of the ski society and football team. He also volunteered in a law firm and then gained a paid position there for the rest of his time as a student. George advised us future lawyers that ‘time flies’ at university and it is really important to take up opportunities to make your CV stand out from the crowd. Another piece of advice he gave us was to be resilient no matter how many times we are rejected. Take on opportunities even if it’s working for free because that widens your personal network and contacts are important and hard work pays off. George decided to go down the path of becoming a solicitor with a view to becoming a barrister one day, so he did his LPC (Legal Practice Course) at the University of Law. George advised us to think carefully before embarking on the LPC because it is expensive and does not guarantee a training contract at the end. Instead, he suggested getting legal work experience e.g. as a paralegal so that you can be sure this is what you want to do. He told us that the LPC was demanding in terms of workload though not as intellectually challenging as the academic study. George did it full time and it was a tough year, but worth it in the end. We would like to thank George for coming and appreciate the helpful tips he passed on to us! It was helpful and interesting to get the view of a fellow former student on the reality of work in this field so that we have more of an insight into what to expect.